The antique watch can work well without a battery, you can wind up the mechanical movement to make power so as to save costs. 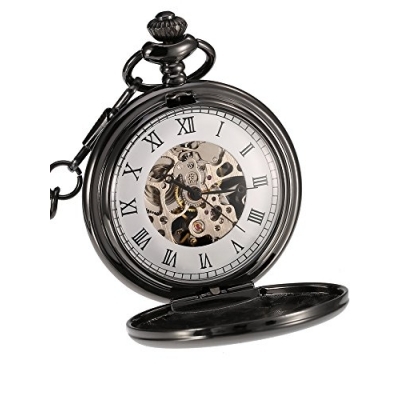 The mechanic pocket watch features stainless steel case and alloy chain, these durable materials make the watch work for a long time; And its delicate design make the watch as an exquisite gift, you can send it to your friends, relatives and other people. 1. Press the crown at the top of watch, the front plate will open. 2. When you first use the pocket watch, please rotate its button (clockwise) until its power is full (15 - 20 times); Be noticed that over winding will ultimately break the spring; Do this once every day before sleeping; Otherwise, it will stop working. 3. Setting time: pull the crown away from base of the watch and turn the crown clockwise until it reaches the exact time. 4. If you feel the winding is tight, please immediately stop spinning to avoid damaging the movement.